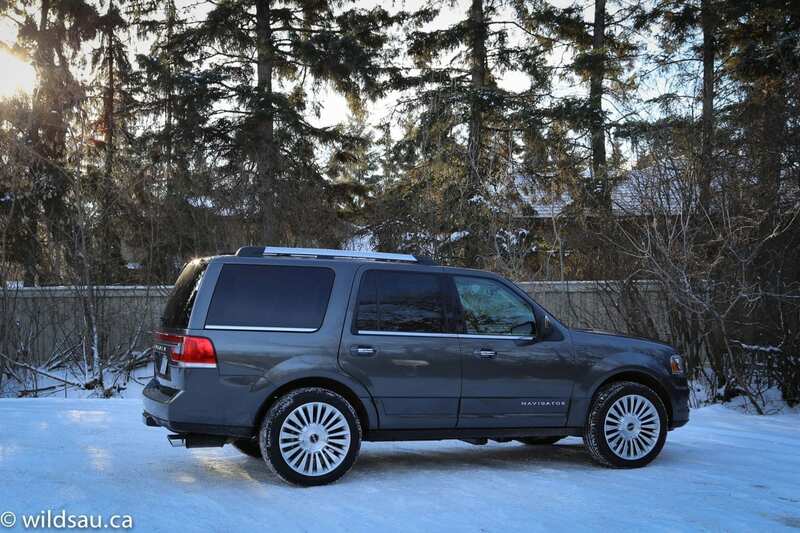 I didn’t know what to expect when I took delivery of the 2015 Lincoln Navigator. Truth is, I’ve made more jokes about this vehicle in the past than it probably deserved. I often considered it a sad relic of the past, built on an old truck platform, and sucking gas like it’s going out of style. But even at first glance, I knew there was more to the new Navigator. While the overall shape has evolved, it remains a huge boxy SUV. 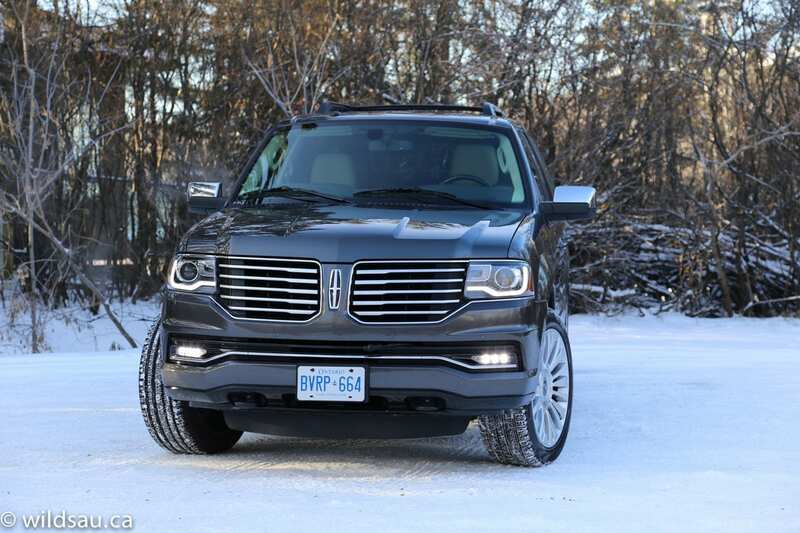 Lincoln has however made noticeable changes along the way and have refreshed this big SUV. 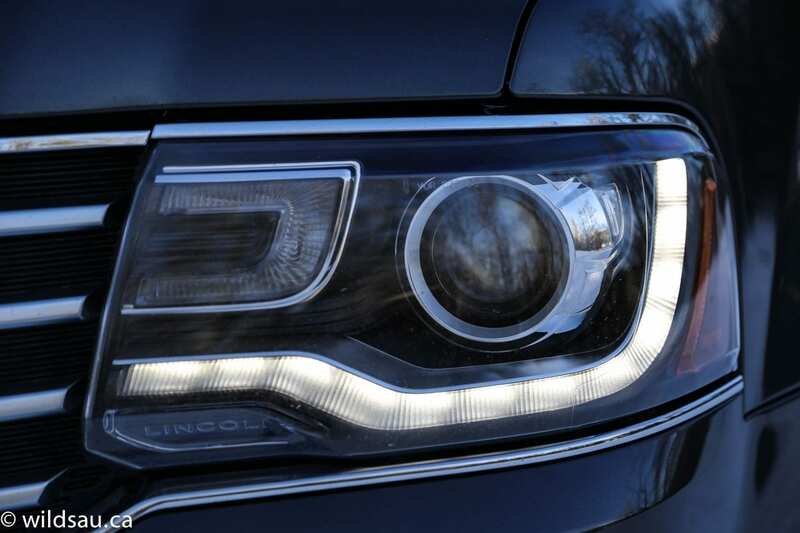 The Navigator is endowed with the new Lincoln grille, which is the best it’s ever been. It’s stately and expressive and classy. HID headlights are cradled in a curved strip of LED lights, and there’s another set of LED driving lights lower in the bumper as well. The slab-sided beast looks confident but remains understated, unlike the Escalade which shows up in the dictionary under “blingy”. But even Lincoln understands the value of some bling, and they fill the wheel wells with it. 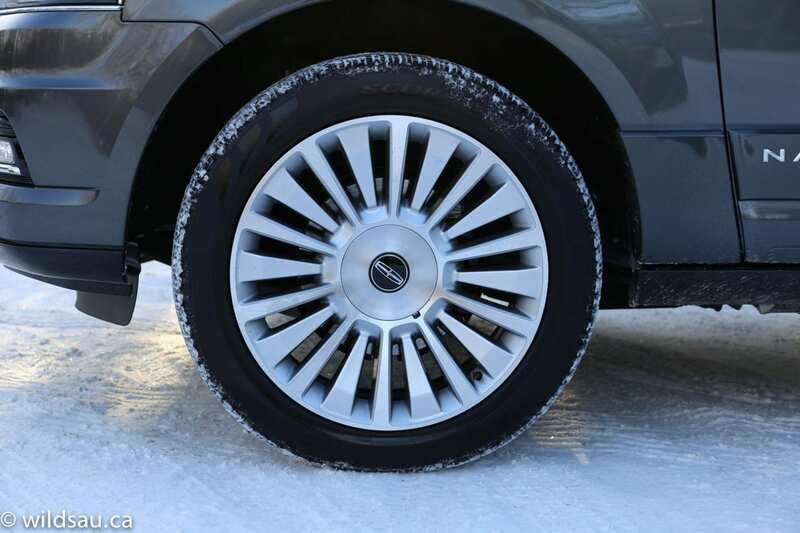 In this case, sweet 22-inch polished aluminum rims that are shod with massive 285/45-sized tires. 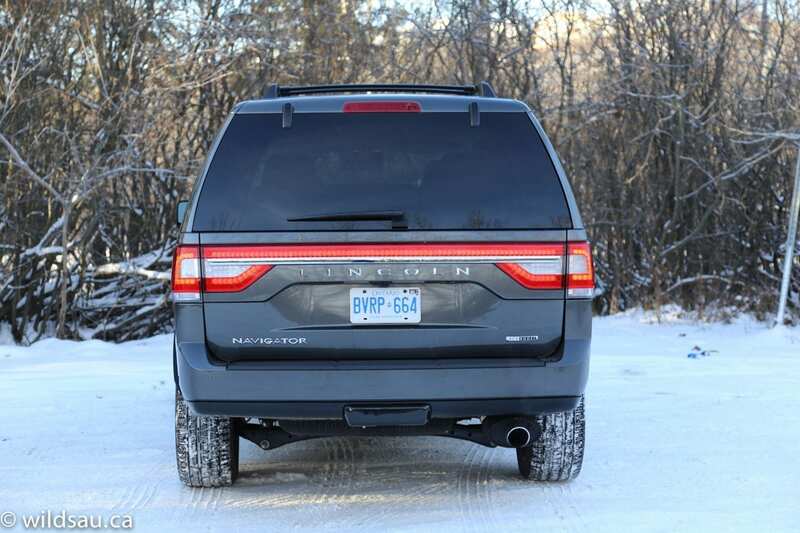 I always hated the Navigator’s skinny little chromed exhaust tip – the new one has done away with it and it finally has one that looks like it means business. While the Navigator doesn’t grab your eyeballs and hang on, it does make a statement. And there’s nothing wrong with an understated statement. A very cool touch – when you step up to the vehicle, you’ll find a welcome mat waiting for you. Lincoln illuminates your path by painting the pavement beside the car with a white LED pool of light, containing the Lincoln logo. Other people in the parking lot will definitely notice this gracious welcome. Of course, the Navigator has keyless entry and a push-start ignition. The high step up into the cabin is made easy thanks to the full-length power-deployable running boards which silently glide down when you open a door, and retract back into the belly of the beast when you close the door. Very slick. 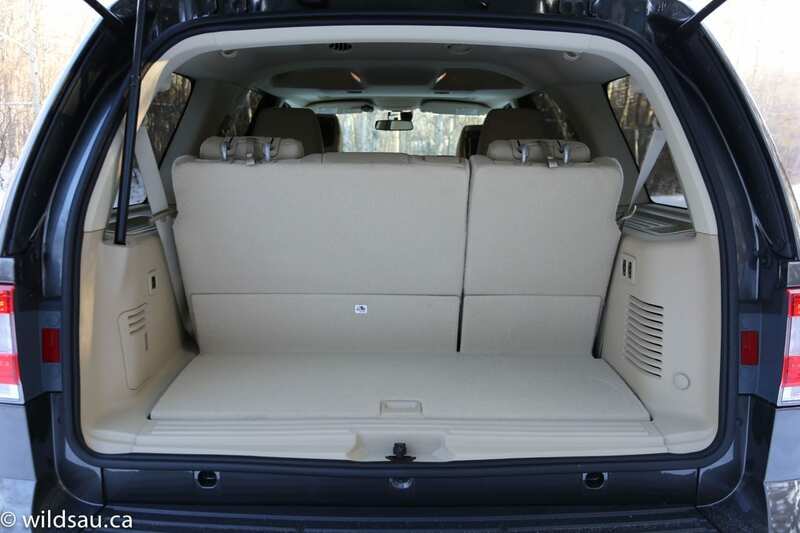 Once in, you’ll find a very spacious interior with ample head room. Everything feels beautifully made and is sumptuous – even to the touch. Any plastics you’ll find are soft and textured, but there isn’t much plastic. 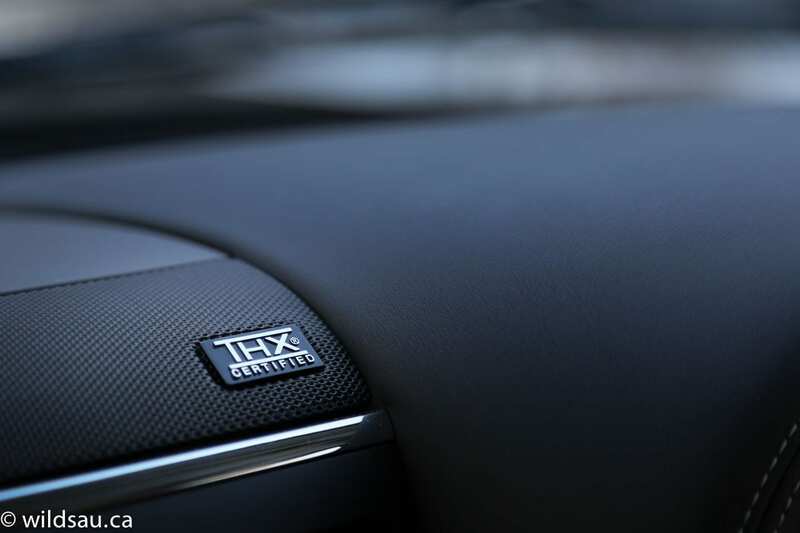 That’s because the dual-bin style hand-wrapped and -stitched dash, the console and even the door trim are all upholstered in leather. Add the gorgeous real wood grain inlays and what appears to be outstanding fit and finish, and you’ve got an interior that truly shines. 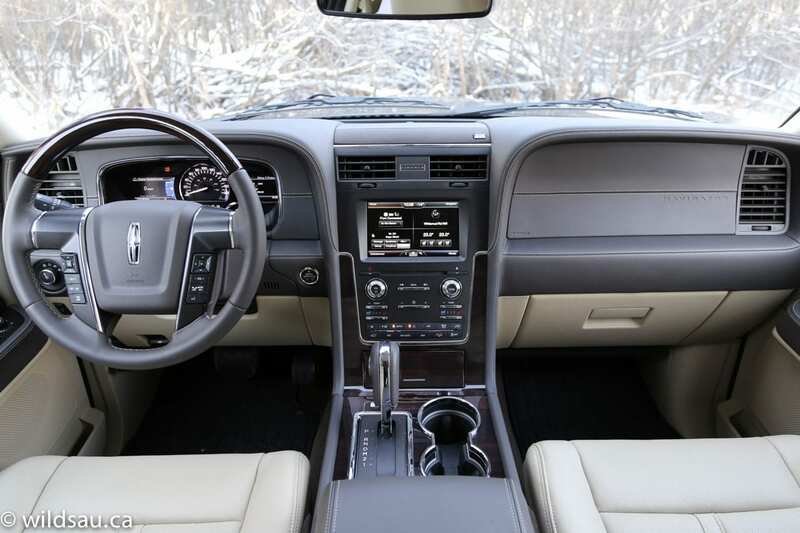 The Navigator’s leather seats – heated, cooled, ridiculously power-adjustable – are exceedingly comfortable. 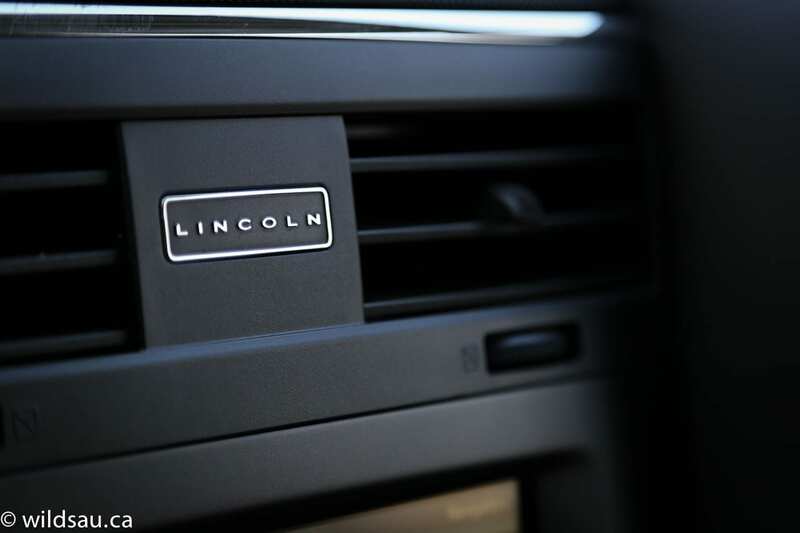 Lincoln says they are clad in Trevino leather, which is absolutely gorgeous. Although I have to wonder if it was named after Lee Trevino, since he really does look like he’s made of some handsome leather. Anyway, where were we? Oh right. The pedals are power-adjustable, as is the steering wheel – it’s a work of art crafted from leather and wood. 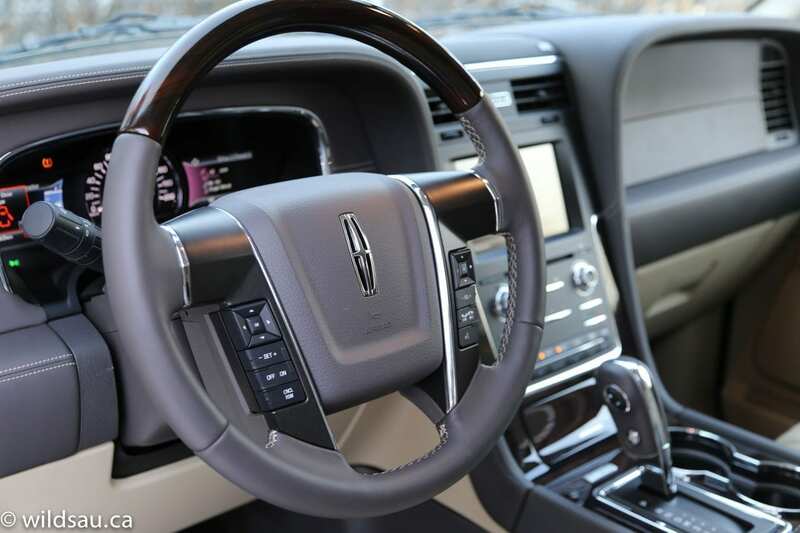 The 8-inch MyLincolnTouch screen that handles media, phone, navigation and climate settings is pretty responsive and the four quadrant system is pretty intuitive. 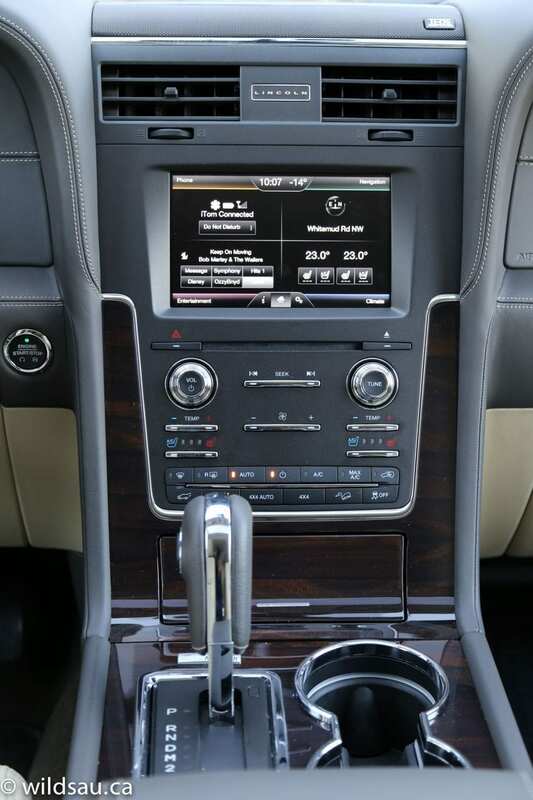 Thankfully Lincoln has done away with the touch control only experiment (those silly slide-your-finger-along-a-capacitive-strip-and-pray-it-will-work days won’t be missed), and they augment the screen with a few hard buttons and a couple of knobs for the main functions. The combination works well with the touchscreen. Unfortunately, the volume and tuning knobs feel a tad cheap to the touch, and when rotated, have a grindy, grainy feeling to them, instead of a buttery smooth ratcheting that I’d expect from something that represents the pinnacle of a manufacturer’s model line. The 14-speaker THX sound system sounds incredible. 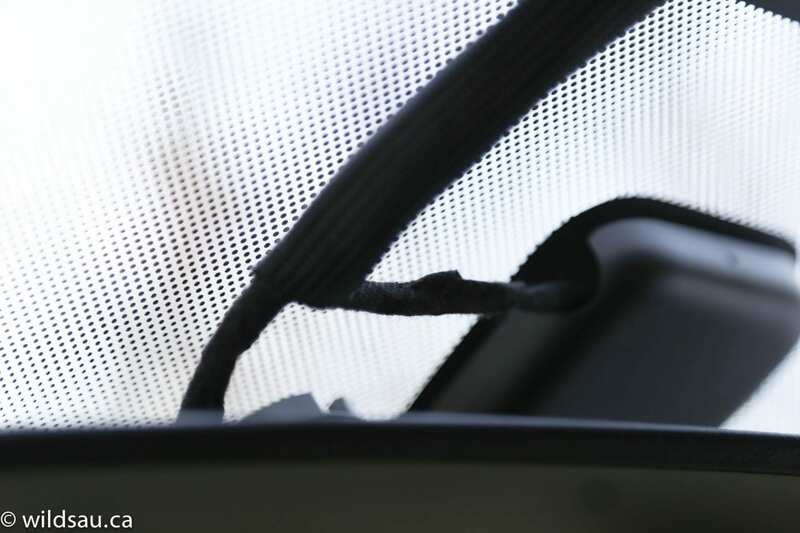 Yes, there’s a moonroof, of course, and some driver assistance technology – a blind-spot monitoring system and a cross-traffic alert letting you know if you’re backing into traffic. 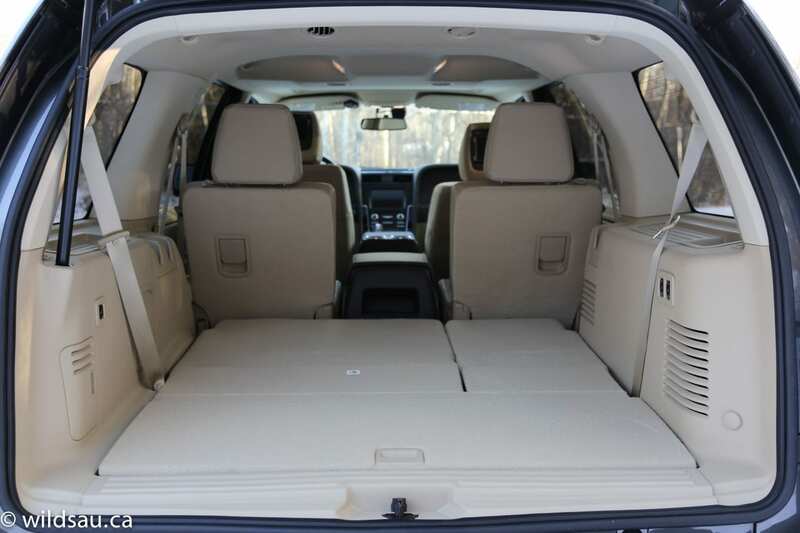 Lincoln ensures that you have three rows of premium seating in the Navigator. 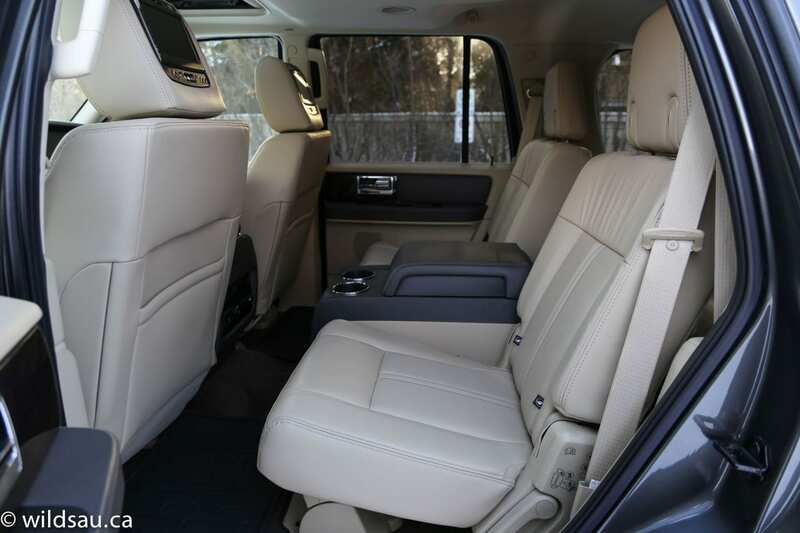 Both the second and the third row seating areas are clad with the same high-end leather you get on the front seats. Lee Trevino would approve. 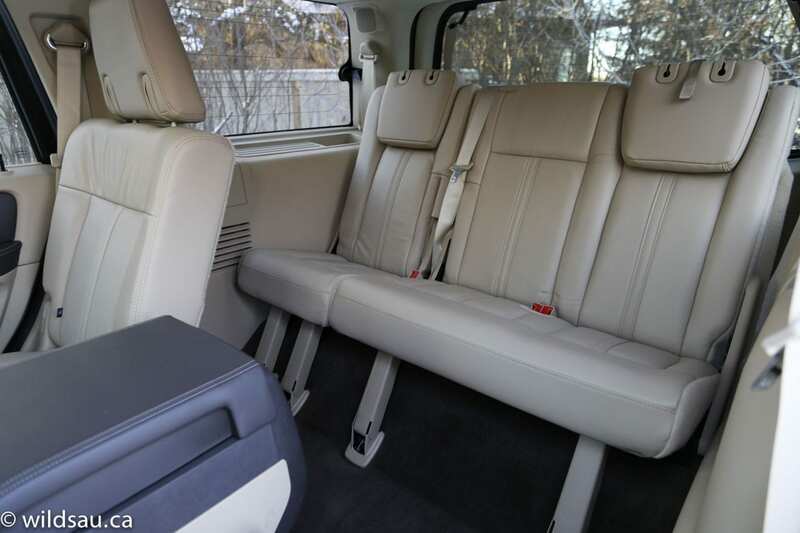 The two second-row bucket seats are heated, and like the front seats, exceptionally comfortable. They recline but do not slide fore and aft, which is a bit surprising. It matters little, as there’s plenty of leg room. 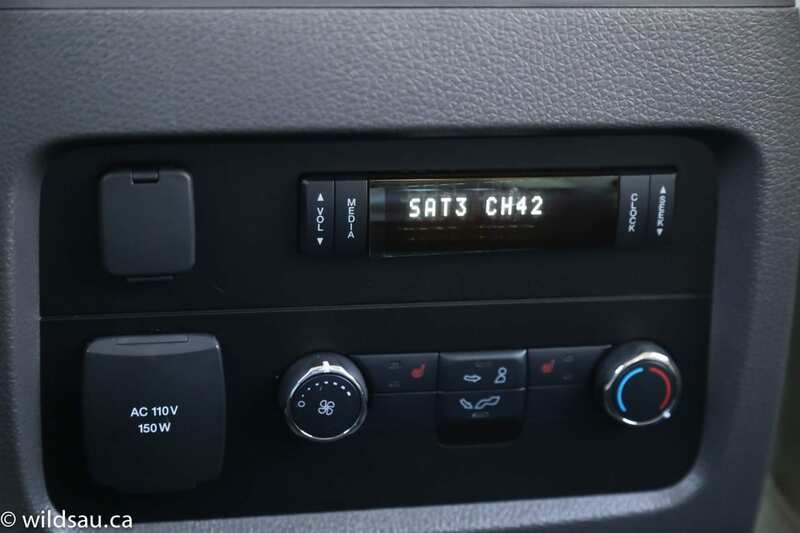 At the back of the front floor console are auxiliary climate controls, allowing second-row passengers to adjust their ambient temperature, as well as 110V household and 12V plugs. There is also a separate audio zone that can be controlled here. 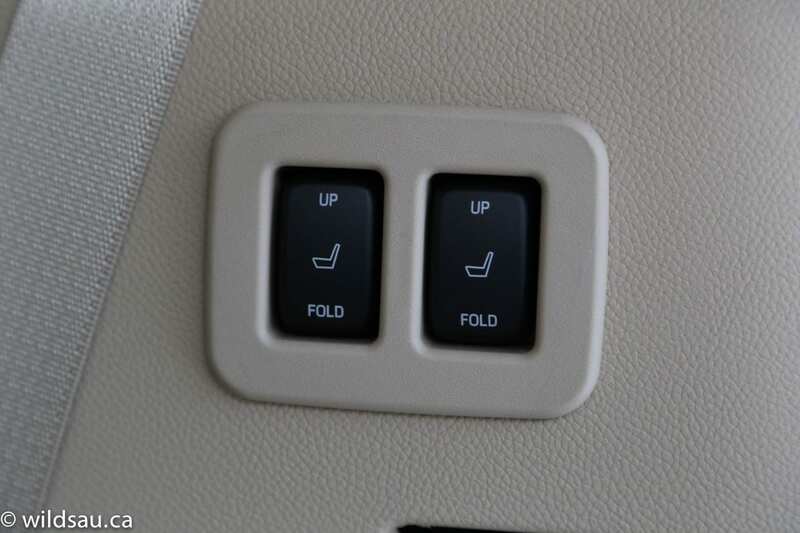 The second-row seats also have a console with padded armrest, covered storage and two cupholders. 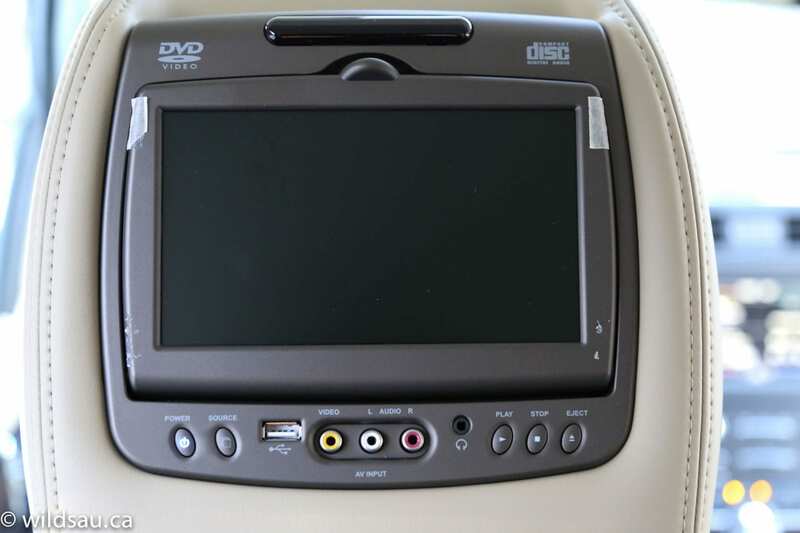 My review vehicle came with the optional DVD entertainment system, putting screens for the second-row passengers on the front headrests. A silly upgrade that is completely limited in utility and vastly overpriced. Skip it and buy your kids each an iPad, which is way more functional and can come out of the vehicle. And save yourself over a grand in the process. You’re welcome. Getting to the third row isn’t too hard as the second-row seats can be tumbled forward. Once you’re back there, you’ll find a row of three seats, which Lincoln claims to have best-in-class third-row leg room and I have no doubt. While the seat cushions are a bit short, the overall space and seating is still more comfortable than any other third-row I’ve been in, with more than enough leg room and head room for me – I’m 5’10”. In my opinion, even the middle seat back there is big enough for an adult, and that really impressed me. 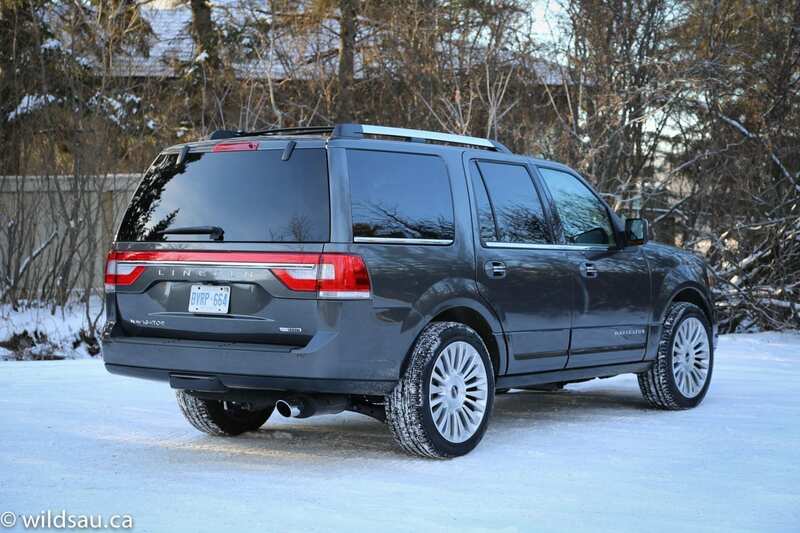 You could transport 7 adults in the Navigator and everyone would be fine. I’m not sure if there are many vehicles that could make the same claim. There are cupholders and storage bins for the back row passengers. With a cabin this size, you can expect plenty of storage (with USB and 12V plugs) as well as four cupholders in the centre console. The power lift gate gets you into the sizeable trunk – even with the third row in use, you get 514 litres of cargo space – more than some sedan trunks. Tap the PowerFold buttons in the trunk, which will fold the third row seats down (in a 60/40 split) and up again, and you’ll find a massive 1542 litres behind the second row. If you want to go crazy and move into your vehicle, fold the second row flat and enjoy the 2926 litre space. The lift gate’s flip-up glass is handy for quick access to the trunk area. Here’s some news. No more massive, old-school V8. The Navigator get’s FoMoCo’s 3.5-litre EcoBoost V6, which churns out 380 horsepower at 5250 RPM and more importantly, 460 lb.ft of torque at 2750 RPM. They’re still using a 6-speed automatic and power ends up going through a Control Trac 4×4 system. A leviathan of this size isn’t going to break any fuel consumption records. Well, actually it might, but on the wrong end of the spectrum. The Navi is rated at 16.2 L/100 km (15 US mpg) in the city and 11.8 L/100 km (20 US mpg) on the highway. We averaged 17.6 L/100 km (13 US mpg) over the week, driving mostly in the city through the snow. You’ll enjoy filling the 106 litre tank about once a week. Obviously the Navigator is a big, heavy vehicle but somehow, it seems to embrace and celebrate these qualities rather than hide them. And I appreciate that. All of its motions are laid back and chilled out. There’s no pretense of sport here – it’s happy to be a full-size SUV and delivers on that promise. Of course you can expect a very luxurious, comfortable ride – one of the best I’ve ever experienced, to be honest – the independent, multi-link rear suspension with continuously-variable dampers goes a long way. 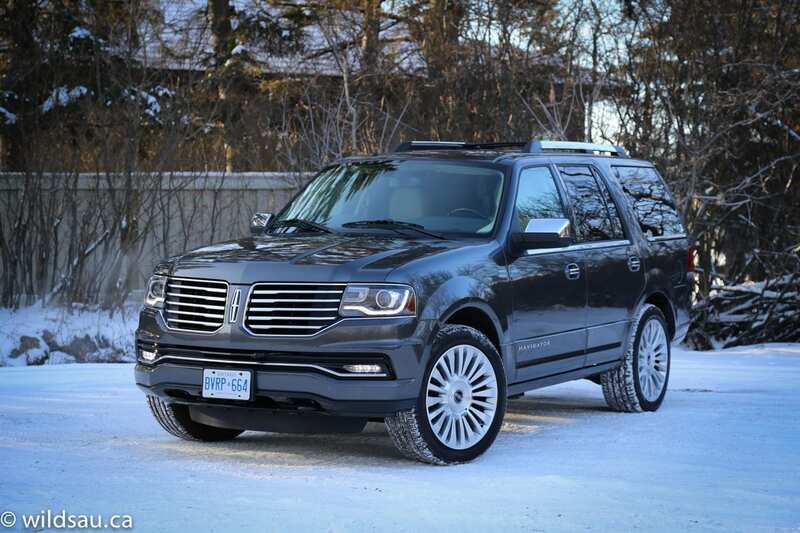 Handling is ponderous around town, but what else could one expect of a full-size SUV? You can toy with the suspension somewhat, switching drive modes between Comfort, Normal and Sport, but let’s be honest here – even Sport mode doesn’t exactly make this thing sporty. Again, that’s not a knock – it’s totally fine for this kind of vehicle. The drivetrain has ample power to move the Navigator off the line, and I can’t imagine a driving situation where I’d need more power. That’s not to say it’s a fast vehicle, by any stretch of the imagination, but it’s not a slow one either – the middle ground is, again, perfectly suited to the Navigator’s mission. There were times where I’d have wanted for more power, but truly never needed it. The transmission is very smooth, and comes across as a bit lazy with downshifts taking a couple of seconds to show up – which is perfectly fine here and suits the vehicle’s character very well. Gears can be shifted manually using a goofy thumb toggle, but the shifts are ponderously slow and I can’t really imagine many times when I’d want to manually shift my gears in a Lincoln Navigator. At least they didn’t insult us with racy paddle shifters. The Control Trac system allows you to choose between rear-wheel drive, automatic 4-wheel drive and full-time 4-wheel drive. 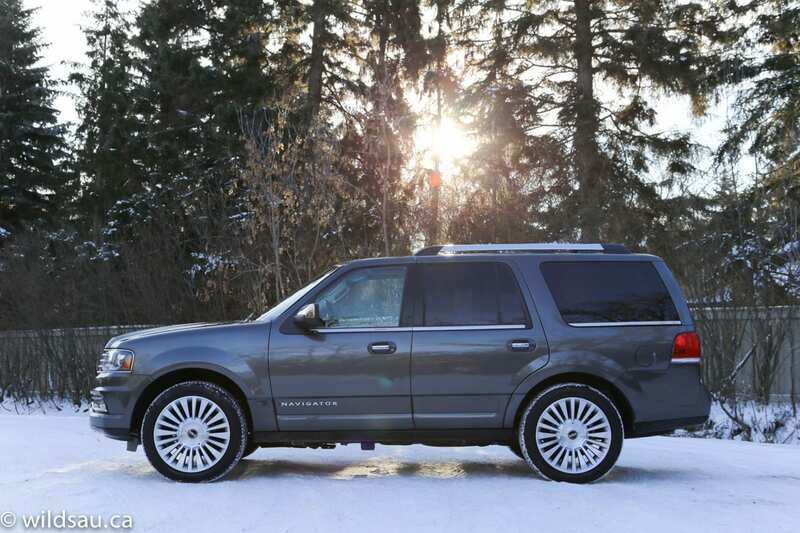 I drove the Navigator during one of our first major snowfalls and the automatic 4×4 mode is very good, grabbing traction whenever it was necessary and providing ample grip and traction when needed. Everything in the Navigator is quiet – road noise, wind noise and drivetrain noise are all very effectively dampened. Interestingly, I did find some coarseness though – in the all-wheel drive system and from the engine. To be clear, it’s nothing intrusive but there were times where I felt it. In the end it’s just not as perfectly smooth as I had expected from a top-of-the-line vehicle. As you can probably imagine, parking the Navigator is no small task, as it is no small vehicle. But easing this land barge into a spot becomes a touch more manageable thanks to the rear-view camera with front and rear parking sensors, as well as the folding side mirrors. Towing capacity is best in class at 8600 pounds (3900 kg) – the transmission has a tow/haul mode and trailer sway control is standard equipment. Hilariously, the Navigator also has a hill-descent mode for all those who will take this thing off-roading. Yep, I’ve got a few. Mostly I found myself taking issue with what was missing in a vehicle that costs this much. While some of these will sound like first world problems of epic proportions, they are the kinds of things one would expect on a vehicle that costs this much. For example, no heated steering wheel. Kias that cost a third as much have heated steering wheels. No Active Park Assist. You can find this feature on basically every Ford and Lincoln product. Why not make it standard equipment on what is basically the biggest thing you produce? Oh, and no adaptive cruise control. This is becoming the de facto standard in the industry among high-end vehicles. Which this is. Not to mention that it’s a stellar road tripper – it would really benefit from that tech. I didn’t like that the button for the power liftgate is inside the trunk (on the left side). It requires you to reach into the trunk and then get out of the way. 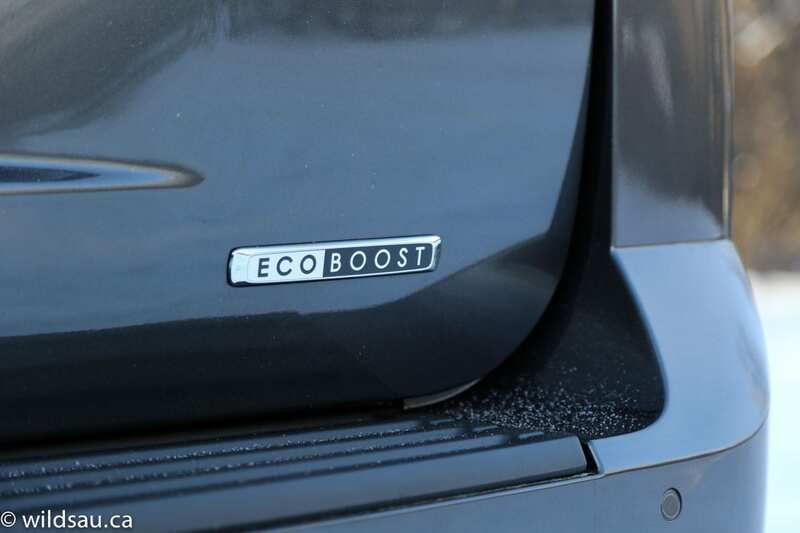 I prefer the button to be on the trunk lid’s edge (where nearly everyone else puts it) where you can just press it and not worry about losing your arm. Because if you were a sloth, that would be a real possibility here. And finally, someone at Lincoln decided it was OK to wrap some wiring with black tape and drop it down from the headliner to the rear-view mirror. Typically a manufacturer hides this wiring with a plastic shroud, but not Lincoln. Nope. And let me tell you – this little thing just really irked me. I’d be pissed if I dropped this kind of coin on a vehicle that sports a beautifully crafted, hand-stitched leather dash – only to look up a couple of feet and see this nasty mess of wiring. And you can’t miss it. Whoever made that call should give their head a shake, because it cheapens the vehicle. It really does. Just terrible. As I said, I wasn’t sure what to expect when the Navigator arrived. But I ended up liking it. Quite a bit. If you’re after a full-sizer and like driving a big, fluffy cloud from the Philadelphia Cream Cheese ads around, this could be the ride for you. Yes, it’s pricey – but they all are. 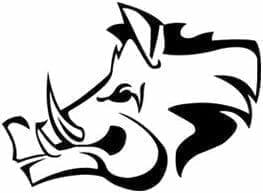 Yes, it’s a pig on gas – but they all are. Yes, it’s freaking humongous – but they all are. None of these things would be a surprise if you’re shopping in this category. Lincoln knocked it out of the park with about 95% of the interior. It’s stunning. The exterior is subjective, of course, but I found it conveyed a sense of elegant, understated luxury – as it always has. WAF (Wife Acceptance Factor) was interesting. She said she was actually afraid to park it and found herself heading to the far reaches of parking lots, just so she wouldn’t have to sneak between cars. But she also said she couldn’t remember a more comfortable vehicle in recent memory and said she’d love to head out onto the open road with our family in a Navigator.